Renting a boat in Amsterdam does not require experience nor a license😳. Small private boats can be rented hourly to explore the city’s canals without having to worry about traffic. It seemed to be a popular activity for any type of gathering- from family reunions to bachelor party groups. Amsterdam, which is the capital of the Netherlands, has also been called the “Venice of the North” because it has more than one hundred kilometers of canals. These canals thus create about 90 islands with approximately 1500 bridges connecting them all together. The canals in Amsterdam not only serve as additional pathways for transportation, but they also assist with water removal. The canals were built in the 17th century to help create more useful space in the city. Herengracht canal was called the Golden Bend because many of Amsterdam’s elite and affluent residents bought land along here to build homes. 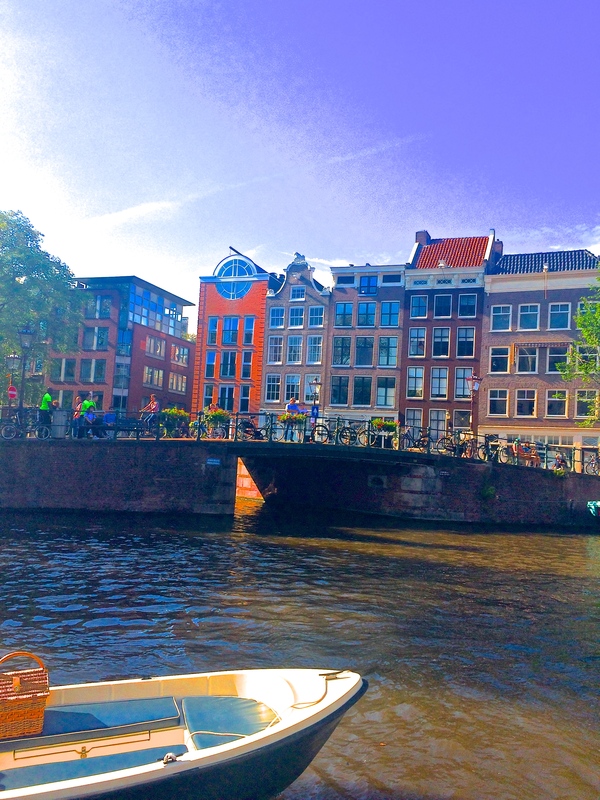 The famous Anne Frank House, which you should get tickets for ahead of time unless you don’t mind a 3 hour wait, is located along the Prinsengracht canal. See our post on another great way to explore Amsterdam which is by renting a bike and riding along the canals.